You will start your farm life on Castanet with a small poultry barn. Inside the barn will be 4 beds for chickens and ducks. You can eventually upgrade your poultry barn to level 2 (8 nesting beds), and eventually level 3 which adds 4 beds for Silkworks to the 8 beds for birds. At the beginning of the game these birds are one of the few animals you can buy. 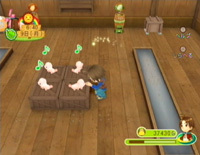 You can purchase chicks from Horn Ranch for 1000 G a piece and ducklings for 800 G each. An alternative way to obtain chicks at the start of the game is to buy the Incubator machine from Barbara for 1000 G, and then just buy a Decent Egg from Horn Ranch for 100 G. Put the Decent Egg in the Incubator and after 7 days you'll have a chick. You can't buy a Decent Duck Egg until the ranch upgrades to level 2. If you are incubating any egg, it will take 7 days to hatch. For a chick or duckling to become an adult you will have to wait another 7 days. You have to feed your chick or duckling every day! The adult birds also need to be fed Bird Feed every day. If they aren't fed then they will not lay any eggs. The birds will only lay eggs if they are inside the poultry barn. If you're in the habit of leaving your chickens and ducks outside to graze like in past Harvest Moon games, you won't have any eggs waiting for you in the morning. They need to be brought back into the poultry barn when you are ready to go to bed for the night. Chickens will lay eggs every day, but ducks will lay eggs every 2 days. 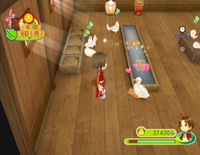 The quality of the eggs will depend on the number of affection hearts each bird has. You can convert the eggs into Mayonnaise by upgrading your barn to level 2 and then you can buy the Mayonnaise Maker from Barbara for 3000 G. Any quality of chicken egg you place in the maker will result in the same quality of mayo, but duck eggs will loose their quality when converted into mayonnaise! Only change Decent, Good, and Perfect Duck Eggs into Duck Mayonnaise. You can increase the affection you have with the chickens and ducks by hand feeding them (instead of putting the feed in the bins), petting them on the head, and picking them up. You can also let them outside on sunny or cloudy days. Chickens and Ducks have a lifespan of about 2 years. Silkworms can only be purchased from Hannah at Horn Ranch after you have upgraded your poultry barn to level 3. A level 3 barn from Dale will cost you 50 Material Stone, 50 Lumber, and 45,000 G.
Once your barn has been upgrade, you can buy the adult worms at Horn Ranch for 4000 G a piece. You can only hold 4 Silkworms in your barn and there is no way to increase that number. Each day you'll had to hand feed each worm some of the Bird Feed. You can raise their affection by petting them on the head, but you can not pick them up like in Tree of Tranquility. They will never leave the barn. Silkworms will generate one Silk every 4 days. The quality of the Silk will depend on the worm's affection. You can convert the Silk into Silk Yarn if you buy the Yarn Maker from Barbara for 4500 G. The quality of yarn you receive will depend on the quality of the Silk being used. The yarn can also be dyed into various colors by combining flowers and herbs with the yarn in the Dye Pot, which can also be purchased from Barbara for 3600 G. The Dye Pot is placed in your kitchen as a cooking utensil and will return to you a single piece of yarn minus any quality the original yarn may of had. Silkworms have a lifespan of about 1 and a half years.